The Pewit Mine and Brickmaking Enterprise at Holmesfield. Pewit from Lydgate. Copyright Michael Hardy. What I’m after knowing is how would clay / fireclay and minerals have been extracted in such a mine? Was this a drift type mine with tunnels dug into the field or does the plan represent underground shafts linked to the tunnels underground? Or was this just a case of hand – digging clay on site ready to make bricks to fire in the kiln shown? I know from your Old Miner site that many collieries operated brickmaking facilities as clay was often to be found when mining coal, but here there is no evidence of coal mining whatsoever. I’m also interested in knowing what type of kiln is shown on the plan – it is rectangular and does not look big enough to produce 000s of bricks in one firing. The Pewit mine and brickmaking enterprise dates from the mid 1860s to the 1880s when I assume the clay became worked out. The enterprise was some sort of partnership arrangement between Millhouses Publicans and Brick Manufacturers Mary Brown (widow of Enos Brown) and her son Edward Brown and my great great grandfather Joseph Slater who was a master brickmaker. In 1841 Census Joseph Slater was Brickmaker at Chatsworth House living in a temporary dwelling in the “Chatsworth Brickyard” which was situated next to what is now the “Brick Kiln Pond” in Chatsworth Park. He made bricks for the drains and foundations of the new North Wing of Chatsworth House and for Joseph Paxton’s Great Conservatory in the Gardens. The Chatsworth Account Books show the payments made to Joseph and his brother John Slater (of the Eastmoor Brick and Pottery Works at Wadshelf) for bricks made. From the mid 1840s to his death at Pewit in 1878 Joseph Slater was a brickmaker making bricks, possibly with or for Edward Brown, at Totley Moor Firebrick Works, at Beauchief, Millhouses and in the Bradway region. All Joseph’s sons were brickmakers working at the Twentywell Brick & Stone Works. 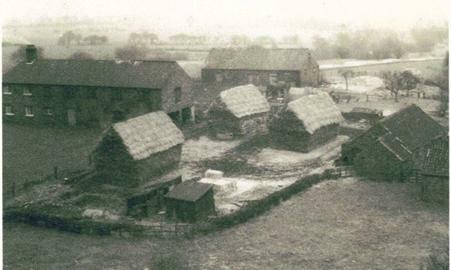 In 1863 Edward and Mary Brown agreed a lease with Daniel Vickers of Pewit Farm for a House and Buildings, together with a three and a half acre field at Pewit. The lease gave Brown rights to extract “the bed of fire clay underneath the said field, and all minerals above the said clay”, with full liberty to work the same. The lease also gave Brown a conditional right “to get the clay on the land adjoining and belonging to the said Daniel Vickers” at 6d per square yard, and paying £1 per acre for any surface damage to Vickers’s farmland once the 3 ½ acre field was mined out. The brick manufacturing enterprise was hugely successful and Brown sought to mine more of Vickers’s farmland in summer of 1872, claiming all clay had been mined from the original 3 ½ acre field. Brown obtained what he thought was permission to do this from Vickers’s solicitor, and started sinking a 50 feet deep shaft on Vickers’s land. For his part Vickers’s claimed no legal agreement had been given, and argued that there was still 9,000 yards of workable clay left on the original site which had not been mined because the Brown’s did not want the difficulties associated with mining it preferring instead to start mining the easier virgin fields. Arbitration failed to find a solution to the dispute which led to Vickers taking legal action against the Browns in the form of a legal injunction to cease mining on his land, as the right to mine the clay from the farmland was conditional on “the whole of the fire clay in the 3½ acre field, next to the buildings, is to be got and paid for before any portion of the land adjoining and belonging to Mr Daniel Vickers is got”. Vickers argued this was not the case, and claimed damages and an additional share of profits in the Court of Chancery for breach of contract. Brown’s counter argument was that all useable clay had been mined and all that remained was of a poor quality and unsuitable for brickmaking. The legal arguments about whether or not the 3 ½ acre field was worked out of clay dragged on for four years, and both sides mustered “expert witnesses” who gave evidence “of a directly contradictory character” and meant the Master of the Rolls was unable to come to a decision . Ultimately, in 1876, the Courts produced their own independent expert opinion which said that there was clay remaining at a depth of 48 feet in the 3 ½ acres field, but that it was of a poor quality and could not be profitably worked. After four years of costly legal arguments and injunctions in the Court of Chancery the Master of the Rolls ruled in favour of the defendants, Edward and Mary Brown, and Vickers was left with costs of the action and a pending claim from Brown for lost profits whilst the injunction had prevented him working the new mine for four years. The newspaper cutting above about the Legal Verdict is from the Sheffield & Rotherham Independent, Saturday Supplement, dated Saturday 29th April 1876. I have driven and walked past Pewit many times and am old enough to remember the old wooden Pewit Cafe close to the Pewit Farms that used to cater for cyclists and ramblers until its demolition some years ago. The buildings and field boundary walls shown on the map appear very much the same today and can be seen from the road, but the field itself is private farmland often with cows and sheep in it. There is no obvious sign of brick making or clay mining activity to be seen from the road now – there used to be three ponds in the field but these were apparently filled in by the farmer some time ago – I can’t remember seeing them in the 30 years I’ve lived in Dronfield. When I get the chance I’ll have a look over the wall and see if I can spot any red shale. What prompted my interest in Pewit was the death certificate of my great, great grandfather Joseph Slater which showed he and his wife both died at “Pewit Hall” in April 1878. I was puzzled as to what a Master Brick Maker was doing at such a remote agricultural site so started to research Pewit which led me to finding the Plan and the newspaper reports of the 1870s detailing the Court actions. Any information you might be able to give re Clay mining and brick making in the 1870s / 1880s would be of great interest to me. Hopefully other people might see the article and contribute their knowledge. I have attached a photo I took last year of “Pewit” – the buildings on the left with two chimney stacks are the Pewit Hall Farms and outbuildings. The modern bungalow and stables behind the jogger is where the old Pewit Cafe used to be. The newspaper cutting about the Legal Verdict is from the Sheffield & Rotherham Independent, Saturday Supplement, dated Saturday 29th April 1876. The history of “Pewit Hall” is interesting. The is no record of there ever having been a Hall at Pewit in the sense of the nearby ancient Halls at Fanshawe Gate, Woodthorpe, Holmesfield and Horsleygate. Pewit Hall looks to have always been agricultural in use. The name Pewit first appears in the Census in 1861 when a farm was occupied by a widow, Elizabeth Fletcher, described as a “farmer’s wife” and her daughter Hannah Fletcher. Elizabeth died around 1862 but by then her daughter Hannah had married local farmer Daniel Vickers. In the 1871 census there are two dwellings at Pewit, one occupied by Daniel and Hannah Vickers and their children (Daniel described as a “farmer of 12 acres”), the other by Edward Brown and his wife and children. Edward Brown was a “Brick Manufacturer” of Millhouses and the dwelling he was living in must have been the one mentioned in the lease with Vickers, next to the 3 1/2 acre field. By 1871 the Brick Yard and Clay Mines behind the dwellings must have been in full swing, with Joseph Slater making bricks on site. In the 1881 Census Daniel Vickers and his family have gone, possibly a result of his having lost the legal battle with his lessee over the right to mine additional farmland. In 1881 Census, Pewit is 3 dwellings, all occupied by Clay Miners and their families. Edward Brown is in 1881 not living at Pewit having moved back down to Millhouses. He is described as a “Beerhouse Keeper and Brick Maker employing two men and one boy”, the beerhouse being the Millwrights Arms (now the Millhouses Hotel). In 1891 Census, only one dwelling is occupied, this by a General Labourer and his family, suggesting the brickmaking and clay / mineral mining has ceased. By the 1901 Census all three dwellings at Pewit are described as “not in occupation”, though by 1911 Census all three dwellings were back in agricultural use occupied by farmers and farm labourers and their families. The Revill family had the Post Office [...] for 35 years. Having retired from postal duties though still working at his shoemaking Mr. Sam Revill had a wealth of reminiscences. Up the hill to the west, about half a mile before the “turnpike” reaches Owler Bar, the remains of three ponds in a field near the road mark the site of a brickyard, which was owned by a family called Slater. The small hamlet is still known as The Pewit. Mr. Revill’s mother, at the age of five, helped at the brickyard. Clay was dug on the spot, and the bricks were sold to Sheffield builders. Samuel Revill, the postman, was the grandson of my great great grandfather Joseph Slater, master brick maker who died at Pewit in 1878. Samuel’s mother, who supposedly helped her father Joseph make bricks at the age of 5, was Hannah Slater who married Joseph Revill and ran the Post office for nearly 40 years. I don’t think my family the Slaters ever “owned” the Brick Yard, but Hannah Slater was born in 1851 when her brick maker father Joseph was living at Millhouses close the the Brown’s pub the Robin Hood Inn. Ordnance Survey 1883. Brickyard is working but by 1899 it is not in use. Also Totley Fire Brick Works SK 42963790 working in 1883 but disused by 1899. In 1923 it is working again as the Moor Edge Silica Brick Works. Old Miner is me and I put other peoples work on too and try to help them along if I can and also hopefully put them in touch with other like minded people or even long lost relatives. Had a good look at the plan and I think it may possibly be one to show the extent of operations up until 1888. I suspect it is to define the area of the take of the minerals. All mines upon entry and exit had to be recorded and all such plans deposited with the Mines Inspectorate by law from sometime early in the 19th century, can’t remember exact date. This was due to accidents where old mine workings were the cause of loss of lives and property. These plans were called Abandonment Plans, although this does not seem to be one of these as there is no comment on the reason for abandonment, like worked out or flooded etc. There were also plans laid out to show the extent of minerals mined for the lease so that the land owner could get his share of the agreed profits or even rent, this is not marked as one of these either so it could also be a plan attached to a sale document for the sale of the mine. Or even a map for the mine surveyor to work from. In 1811 according to General View of the Agriculture and Minerals of Derbyshire. Vols. 1. J. Farey. Pp 450-451 fireclay is being mined at Holmesfield in the third coal shale, Dore and Totley are also mining it. There is a link to a free e-copy on my site. The seam of clay dips down or is laid in the ground at a 1 in 12 gradient from Owler Bar to Holmesfield. The first shaft at the bottom of the plan which is 7 ¼ yards deep appears to be in another seam and some of the workings are marked as ‘Old Workings’ suggesting that prior to this work someone at an earlier date has worked the minerals or others in the mine. Plans normally only show one seam at a time. Is there any evidence of any red shale on the floor on the surface, this is tell-tale coal mining debris? This is indicative of coal mining operations. I think all the circles on the plan are all air shafts, one away from the clay mine 22 yards deep and water filled may have been an earlier attempt to access the reserves and flooded or was intended as a pumping shaft as it is down the gradient from the main workings and would be ideal to drain the workings. I think that the mine was solely by shaft and no walkable outlet, no drift or adit was drifted into the workings from the surface. (I think). I looks like a main roadway was driven and then serviced for air by the other five shafts along the length of that roadway the spoil and the extracted clay would be would up the shaft nearest to the kiln the 11 yards to the surface in tubs. The clay would be extracted by powder and fuse (possibly) and loaded by hand into tubs to be taken out of the mine each tub when full weighing over a ton. There may have been a haulage system underground running from the surface winding engine but as the main roadways appear level it may be that they were manhandled along from the workings to the shaft side. (Ponys or small horses may have been employed??). The clay would then be ground and mixed in a machine with water to a consistency that would make it suitable for moulding into a brick shape. The clay mix is to be made into fire bricks, for the lining of Kilns, iron blast furnaces, it can be made into a mortar for laying fire bricks and stones in furnace linings and for making course crucibles and saggers for the China factories. Therefore they are a specialist brick and clay. Normal clay may have been found here too and used for producing normal bricks. A ‘Plastic Brick’ making machine was available but I would suggest the expense of purchasing one her might have been prohibitive for the small scale working. I will let you know if I come across anything else. Copyright Derbyshire Records & Archives Service from Pearson & Company Potteries.